Analysts have been pointing out that earnings for the S&P500 companies continued to surprise to the upside for Q2 results. The top-line numbers however were not nearly as impressive. 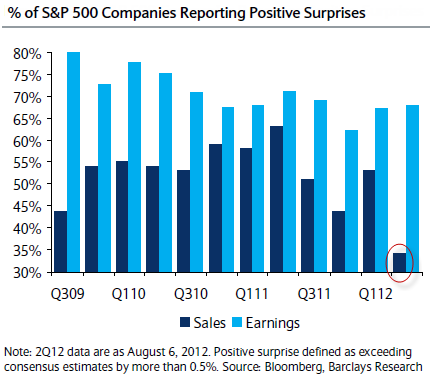 In fact this has been the lowest percentage of positive revenue surprises since at least 3Q09. Nasdaq: - While roughly two-thirds of companies beat earnings expectations, the beat ratio on the revenue front is far weaker - only 37.6% of the companies have beat revenue expectations. Even some of these companies with positive revenue surprises for the second quarter have guided towards lower revenue numbers in the coming quarters. This does not bode well for growth in the coming quarters. The global macro pressures have impacted revenues far more because of a sharp decline in commodity prices that helped improve margins. Barclays Capital: - The global growth slowdown has had more of an impact on revenues, as margins were aided by a sharp drop in commodity prices in the second quarter. Additionally, ... companies have begun to cut their forward financial outlooks, suggesting that macro concerns are beginning to weigh on corporate operating performance. Given the recent reversal in commodity price declines, the ongoing macro concerns, and lower revenue guidance in the coming quarters, the Q3 earnings picture now looks far less certain. The strong market performance in recent weeks however seems to be ignoring this development.